Last night was the latest InsTech London event. 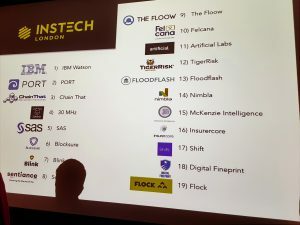 InsTech, or InsureTech or InsurTech (please can someone confirm the standard nomenclature?) applies to the insurance industry in the way that FinTech was the industry disruption in the financial industry. Insurance is ripe for this disruption because so many business processes are done on paper (quite literally – and this is where the term underwriter comes from) or a combination of Excel spreadsheets and email. InsTech London was hosted in WeWork’s trendy office in Moorgate. There were 19 start ups, or new technologies. IBM doesn’t qualify as a start up, but its Watson technology sort of does. I liked the format of the evening – each of the 19 companies had their own desk. We chose 5 start ups from a list and heard a five-minute presentation from each of them at their desk. A bell rang at the end of 5 minutes encouraging the audience to move to the next presentation. With each presenter trying to make themselves heard, I doubt the WeWork office has been so loud at 7pm on a Tuesday evening. Here are the five start ups I visited. IBM presented their Watson Artificial Intelligence technology, focusing on regulatory compliance. They had uploaded lots of legal documents and then performed free text questions on them. Examples included “What’s the difference between mifid and mifid2 across all these documents?” As you’d expect from IBM, the demo was slick – they used this video. ChainThat is a slick front end to a blockchain implementation of a full insurance workflow. To become successful, Blockchain needs more demos like this illustrate what’s going on. ChainThat is a bit like Salesforce.com for the insurance industry – they had digitised (i.e. replaced the paper part) for every role in the insurance industry, from end users with a claim, to insurers, reinsurers and underwriters. Sentience is a mobile app which claims to be able to tell who is driving a car based on a mobile accelerometer. It does this by learning by the smoothness, and other factors, who is driving the car. Sentience is trying to create a value exchange model for this data. I.e. “In return for knowing where you shop we’ll give you this reward.” It’s a tough challenge for Sentience – there are many other apps doing this at the moment, from Google Maps to Amazon Alexa. As the insurance industry becomes more automated, through smart contracts or other means, data services from companies such as Mckenzie Intelligence will become increasingly important. Floodflash isn’t quite live yet. It’s a hardware service with a primary model to pay flood victims, especially SMEs, much quicker. Their flood detector is positioned on a wall of a customer and… detects a flood. The aim is to get that business operational again, more quickly than other local companies. Just like this Mckenzie Intelligence, these types of connected devices will be vital for future insurance models. 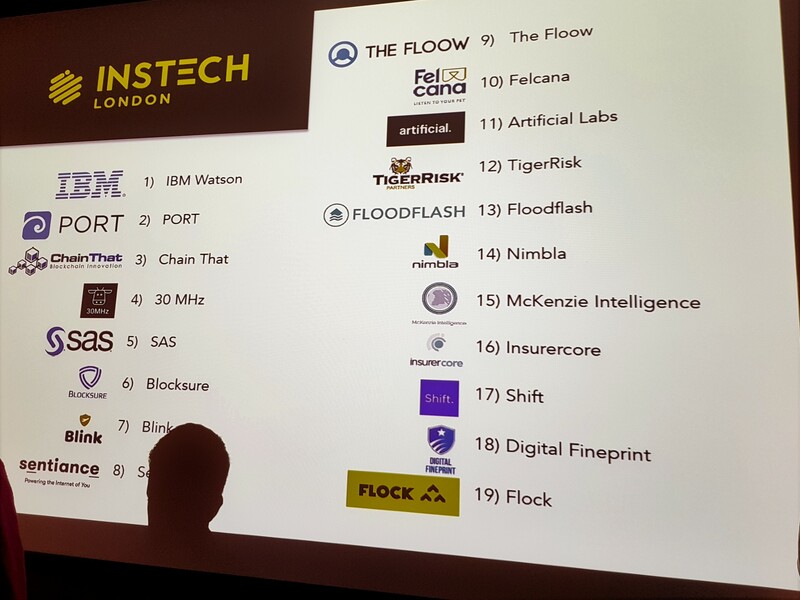 I enjoyed the InsTech London event. It was professionally organised and executed. There must have been 200+ visitors – the room was packed and rather hot. The companies which attended were a good range from niche start ups (e.g. drone insurance) to giants like IBM and SAS. I recommend anyone who works in the insurance industry attends these types of events to see what the future is likely to look like.